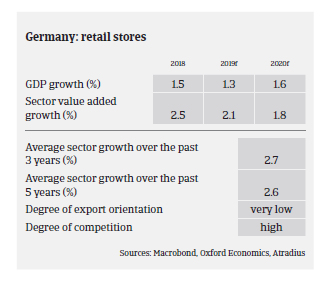 According to the German Statistics Office non-food retail real turnover increased 1.2% year-on-year in 2018 – the ninth consecutive year of growth. 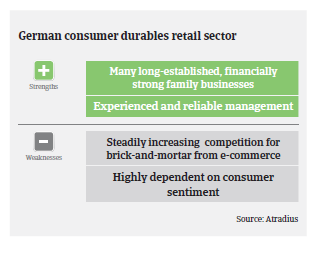 German consumer durables retail benefited from the country´s robust economic performance, with demand driven by low unemployment and increased household purchasing power. However, turnover growth was lower than in 2017 (up 3.5%), and while further expansion is expected in 2019, growth could slow down again as economic uncertainties have increased. According to the German association of furniture industries BVDM, turnover in the furniture segment decreased 2% in 2018, to EUR 32.9 billion. However, in 2019 the BVDM expects demand to increase again. According to the German Electrical and Electronic Manufacturers' Association ZVEI, in 2018 manufacturers’ sales of large electric domestic appliances levelled off compared to 2017, and sales stagnation is expected to continue in 2019. However, sales of small electric domestic appliances by manufacturers are expected to increase about 1%-2%. German textiles sector value added contracted more than 4% in 2018 and another 2% contraction is forecast in 2019. The payment default risk in the textile retail segment has increased since H2 of 2018, as an unusual warm late autumn negatively affected sales of winter clothes. Besides dependence on seasonal events, textile retail structurally suffers from low equity ratios of many businesses, high rental fees in many cities and thin margins due to online competition. Many brick-and-mortar retailers still lack successful online sales channels, while some online clothes retailers lack efficient logistics. Mainly smaller and mid-sized retailers will continue to struggle in their efforts to cope with the fast growing market leaders. At the same time, the competitive pressure from online retailers has further increased (in 2018 online sales of consumer durables grew more than 11%). In segments where the market share of e-commerce has expanded rapidly (e.g. consumer electronics, electrical domestic appliances, furniture, leisure articles, clothing) competition is fiercer and pressure on margins higher, which dampens the future prospects of mainly smaller brick-and-mortar retailers. The best way for smaller retailers to survive in this very competitive market is to join a large purchasing association and to compete with e-commerce by providing outstanding service, e.g. advisory services, easy return of goods, etc. In general, payment duration in the consumer durables retail segment ranges from 30 to 60 days, however it can extend to more than 120 days, depending on the market power of individual retailers. Payment behaviour in the German consumer durables sector has so far remained both good and stable, with a low share of protracted payments. Businesses margins however are expected to decrease further in 2019 due to the fierce competitive market environment in most segments. Price transparency, made available to consumers by online retailers, maintains pressure on margins along the whole value chain. Consumer durables retail insolvencies are expected to increase in 2019, probably on par or even higher than the 2% insolvency increase expectation for all German businesses in 2019. 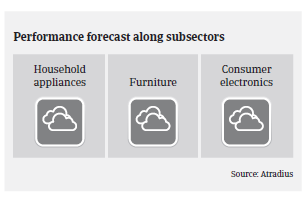 Despite persistent sales growth and stable consumer sentiment, we see consumer durables retail as a medium-risk sector, mainly due to the increasingly difficult market situation of smaller players. According to the retail federation HDE, only 10% of small high-street retailers are satisfied with their business situation, while 75% reported lower footfall in 2018. Our underwriting stance is generally neutral for consumer durables retail, while being more restrictive for textiles and footwear retail. We continue to closely observe the growing competition between online and brick-and-mortar retailers (in 2019 HDE expects a turnover increase of 1.2% for brick-and-mortar retailers, compared to about 9% for online traders). In segments with a steadily increasing share of e-commerce we try to obtain interim accounts in order to continuously check if buyers are able to keep sufficient margins. When businesses cannot pass on increased costs to customers/consumers or compensate for this with savings elsewhere, they might demand extended payment terms. We monitor payment behaviour closely in all subsectors and inform our customers immediately of any deterioration. We are reluctant to cover newly established firms during their first year of business unless they are members of a well-known group or have branched out from an established company. 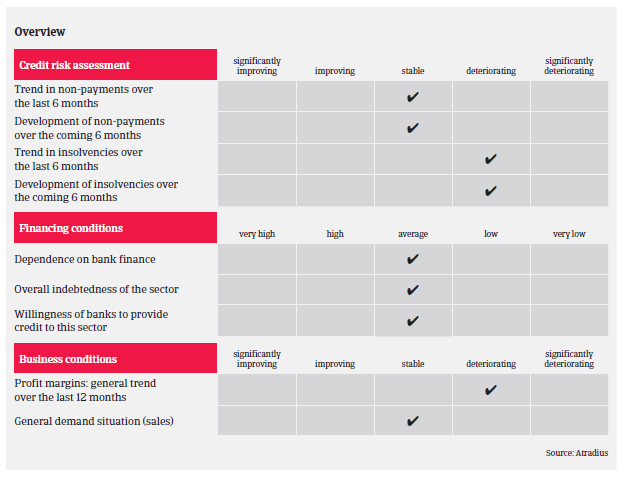 Many smaller construction companies have weak equity ratios and limited financial scope, which makes them vulnerable to payment delays and defaults.